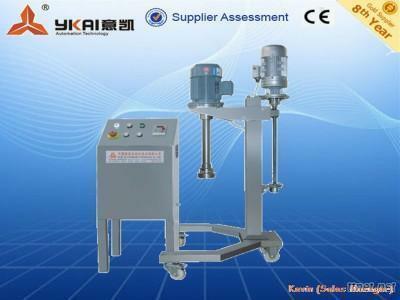 the homogenizer on main shaft working by electromotor makes the material produce high centrifugal speed. by strong cutting off, impact and turbulence from high shear wheel and the cutting case, the material turns to particles of 200nm-2um at the cutting interstices and dispersed within a short time. 1. Warranty time: one year, from the date which the product is qualified commissioning. Any damage except the wrong operation during warranty period is repaired freely. But the travel and hotel expenses should be count on buyer. 2. Commissioning services: the product's installation and commissioning at the demand side, our engineers will not leave there untill get your agreement. 3. Training services: our engineers will train your staff to operate it during the period of installation and commissioning, and they will not leave there until your staff can operate it properly and normally. 4. Maintenance services: any malfunction happened, once you enquiry us, we will reply you within 48 hours except the special reasons. 5. Lifelong services: we provide lifelong services for all the products we sold out, and supply the spare parts with discount price. 6. Certificate services: we can provide related certificates to customers freely according to the request of customers. 7. Inspection services: you can ask the third part inspection company or your inspector to inspect the products before shipment. 8. the file: the Manual Specification, report of the material which used to the equipment and others documents related to the GMP authentication information will be provided by us. Wuxi YK automation technology co., Ltd includes three subsidiary companies: Wuxi jianuo delicate chemical equipment factory, Guangzhou jianuo machinery equipment co., Ltd., Wuxi jianuo commercial trade co., Ltd. It is a technological innovation enterprise of a collection of R and D, manufacturing, sales and service. Our company is located in China’s Yangtze River Delta hinterland, Wuxi Zone, an area of 20, 000 square meters.